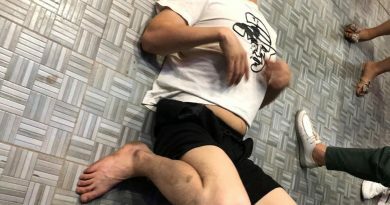 SHK: In the early morning of December 5, a Chinese woman, Wu Jianxia, was seriously injured after being attacked in Sihanoukville. She was sent to a hospital in Phnom Penh for treatment and is still lying in the intensive care unit in a critical condition. Her husband Mr. Liu is also now in Phnom Penh, but due to the high cost of treatment, and due to air pressure problems, they can not return to China. According to doctors, they need to stay in Phnom Penh for aboutsix months. The cost of treatment and living expenses will be big burden for them. It is hoped the Chinese community in Cambodian can lend a helping hand to help them tide over the difficulties. Mr. Liu arrived one year ago, and he opened a small massage shop with five or six friends. There were not much savings, and their children at home had just gone to college. She was attacked at the intersection by an unknown assailant and left with serious head injuries. The traffic police first said that she was a victim of robbery, then told them that they had closed the case and characterized it as a traffic accident. Together with two mobile phones, more than 1,000 US dollars and bags were looted. Because of the traffic police’s case description, Mr. Liu could not apply for help from the Chinese Relief Fund. If a person is in a foreign country, there is no need to face huge expenses without income. Mr. Liu urges everyone to lend a helping hand to help them through the storm. If you are willing to help, please contact Mr. Liu, contact number: 0968519458.